Malaysia Boleh! restaurant has two locations in Singapore, one at Jurong Point mall (1 Jurong West Central 2) and another within AMK Hub shopping centre (53 Ang Mo Kio Avenue 3). Owned and managed by Fei Siong Group, Malaysia Boleh! 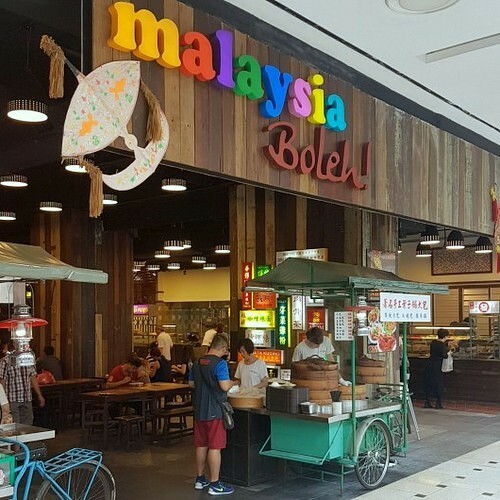 offers a menu of authentic Malaysian street hawker fare, featuring some of the best street hawker dishes from whole of Malaysia, available under one roof. Highlights and customer favourites on the menu include Penang Jalan Cheong Fatt Tze Prawn noodles soup, Petaling Street Famous Claypot Rice, and Klang Bak Kut Teh. There are a total of 17 stalls and pushcarts at Malaysia Boleh!, all done up in a vintage style. The interior walls are professionally decorated to look like the facade of a row of old shop houses, meaning that once inside Malaysia Boleh!, you can feel the nostalgic street-like ambiance reminiscent of the golden era of the 1960s. The official Facebook brand page for Malaysia Boleh! restaurants is available at www.facebook.com/MalaysiaBolehSG/. You can also follow the restaurant chain’s official Instagram account, which in turn is located at www.instagram.com/MalaysiaBolehSG/.